What does one do with leftover chocolate ganache? One turns it into Chocolate Ganache Truffles! After the Great British Bake Off Birthday party we had quite a bit of chocolate ganache leftover from the Almond Joy cake. We didn’t know at first what we were going to do with it, but one thing was certain. Never throw out perfectly good chocolate. I quickly discovered that you can use chocolate ganache to make delectable chocolate truffles. All you need to do is take the chilled ganache, roll it into balls, and then roll those in some toppings. 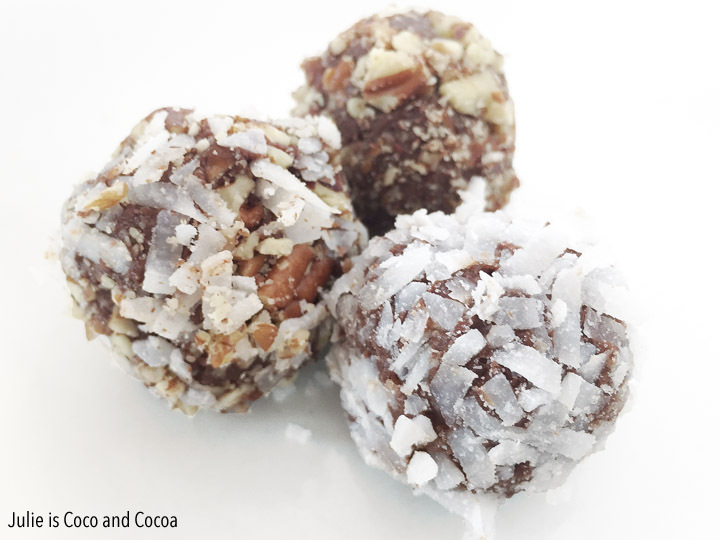 I went with shredded coconut and chopped pecans for my truffles. I put both the nuts and the coconut flakes into the food processor to make them small and easy to adhere to my truffles. Grab the chocolate ganache recipe, get it chilled, and then we can start with the truffles. Make sure the ganache is completely chilled before using. Overnight would be best. But don’t freeze it. Scoop all the truffles out before rolling them into balls. Refrigerate between steps to keep the truffles firm and cool. Warm hands make the truffles melt fast. I found a trick to keep an ice pack nearby to cool your hands off. I put a paper towel over the ice pack and put my palms down on the ice pack in between rolling each ball or two. Serve truffles at room temperature. Store finished truffles in an airtight container in the refrigerator. 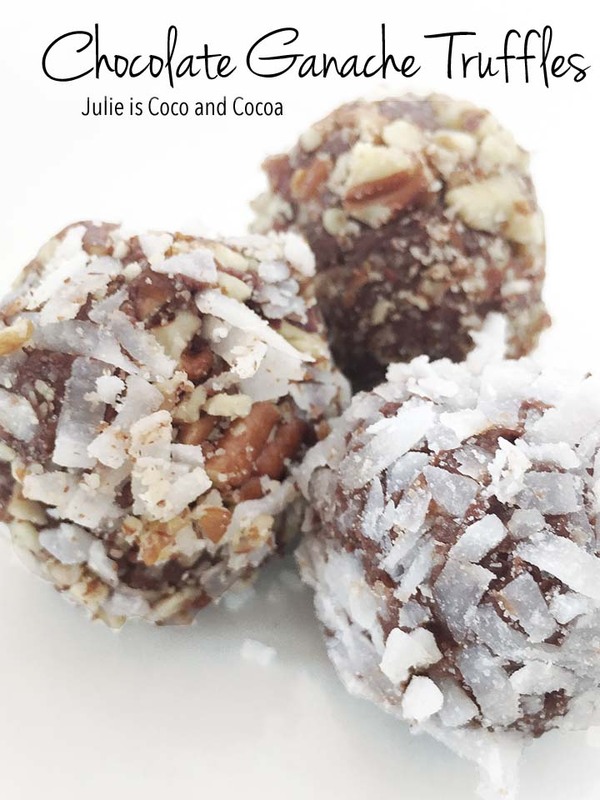 Enjoy your easy to make chocolate ganache truffles! Bless you for sharing these with me. They are so good! I’m glad our efforts for the cake could be used twice!